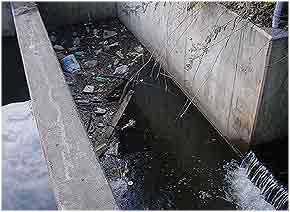 A sediment trap on Buckingham Creek fills with garbage carried by the stream. All sources of stream contamination aren't so obvious. Use the links at left to learn more about what impacts the water quality of our streams. Our streams are passageways for much more than just their natural inhabitants. They carry water washed from our roofs and parking lots, yards and roadways. This water carries with it things we can see like sand and garbage, and also dissolved particles of oil, pet waste, lawn fertilizer, road salt and more. We can't remove all of the sources of these contaminants from our watersheds, but we can educate ourselves about their impacts on our streams, and how to minimize them. 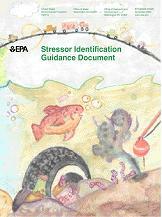 CADDIS, otherwise known as the Causal Analysis/Diagnosis Decision Information System, is an online application that uses a step-by-step guide, worksheets and examples to help scientists and engineers find, access, organize, share and use environmental information to evaluate causes of biological effects observed in aquatic systems such as streams, lakes and estuaries. The CADDIS site contains technical information (guidance, worksheets and examples) and was designed for use by scientists and engineers.